Does Baby Need Supplements, or Vitamin Drops? Learn about Vitamin and Iron Supplements for baby. 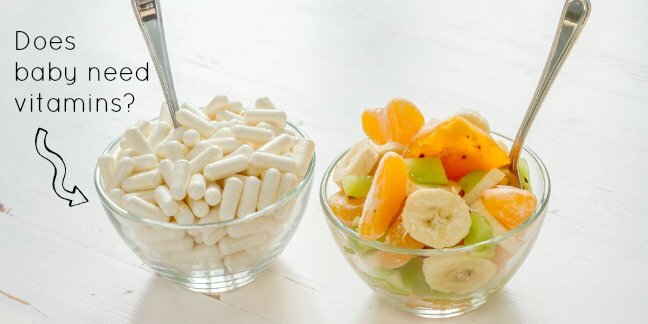 Do Babies Need Vitamin or Iron Supplements? Have you been wondering if your baby is in need of vitamin or mineral supplementation now she has begun to eat solid foods? This is a question that often runs through the minds of parents. Many pediatricians recommend starting a baby on solid foods around 4 months old and oftentimes, with that comes the recommendation that baby begins a vitamin supplement; specifically one that contains additional Iron. A healthy full term infant who is beginning solid foods may not need vitamin and mineral supplements. It is most important to note that delaying solid foods until baby has reached age 6 months or older allows for the maximum intake of essential nutrients. Breast milk or commercial fortified formulas contain all the nutrients an infant needs. This includes vitamins and minerals. Vitamin and mineral supplements are not crucial to an infant’s diet. If there is a known deficiency, such as Vitamin D, Vitamin K or Iron for example, then supplementation may become necessary. Does My Baby Need Fluoride? If baby does not need a Vitamin supplement, the one exception may be for a Fluoride supplement. The use of Fluoride supplements in infants and toddlers has garnered some negative attention. There are many doctors, scientists and even dentists that are against giving a Flouride supplement due to the possible dangers. Visit the Flouride Action Network to learn more about this issue. Please be sure to consult your pediatrician regarding use of fluoride (or any other vitamin/mineral supplements) as said supplements may be harmful under certain circumstances. Your baby has very little exposure to sunlight – if you live in a region where there is a lack of sunlight, such as far northern areas like Canada, Sweden etc. You and/or your baby have dark skin – Darker skin means that more sunlight exposure is needed to generate Vitamin D.
You were/are deficient in vitamin D – If Mom is not exposed to sunlight and does not drink/eat diary products that are high in Vitamin D, she may be deficient and not even know it. The AAP released new recommendations for Vitamin D supplementation in November of 2008. This recommendation was prompted based on an increase in the cases of rickets in infants. The increase in rickets has particularly affected low-income, minority babies. “The rickets that’s been seen in the United States has been largely in minority populations who’ve been part of the WIC [Women, Infants, Children] program, where they’ve been emphasizing breastfeeding,” said Greer, noting that 55 percent of all infants in the U.S. are involved in the program to provide food, health care and nutrition information for low-income women. And while breast milk may not be a good source of vitamin D in any case, underprivileged, minority populations are more likely to be deficient in the vitamin. The current (Nov. 2008 AAP) recommendations for Vitamin D supplementation are that all infants and children, including adolescents, have a minimum daily intake of 400 IU of vitamin D beginning soon after birth. So should you give your baby vitamin supplements? In short, there is no need to begin giving an infant vitamin supplement solely because the baby has reached age 4 or 6 months and may have begun solid foods. Discuss supplements with your pediatrician. You should feel free to ask if there is a real need for your infant to begin supplements if you are unsure about wanting to give them. Does feeding my baby homemade baby food place her at risk for vitamin or mineral deficiencies? As regards homemade baby food, there are no greater concerns or needs for vitamin supplementation just because you may be making all of your own baby food. Infants fed homemade baby food are no more at risk for vitamin/mineral deficiencies than are those that are fed commercial foods. In fact, other than commercial baby cereal, commercial baby foods are NOT fortified. Making your own baby food does not mean you need to use supplements nor does it mean that your infant will be lacking in proper nutrients of any kind. Remember, an infant’s main source of nutrition is still received from formula and/or breast milk.